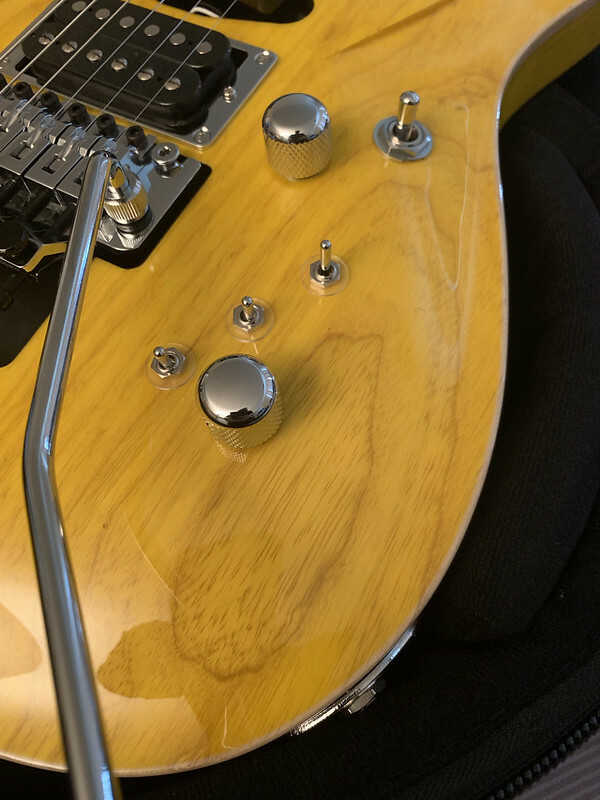 Discussion in 'Standard Guitars' started by AltecGreen, Mar 25, 2019. After a bit of a struggle, my new guitar just arrived. I was watching a Mary's Blood concert on Blu-Ray I bought from Japan (at an exhorbitant price) and was trying to figure out what guitar Yashiro was using. After a bit of prowling around Youtube trying to find a clean video of the headstock, I found out it was a G-Life guitar. So I googled the name and found this site. I had just sold my 6 string Mayones Setius and planning to buy a new guitar. I figured I would buy a Japanese guitar since I did not have one. Originally, I was going to buy a Zemaitis since they were blowing them out but then I did some searching then switched to a Ryoga. Then this happened. 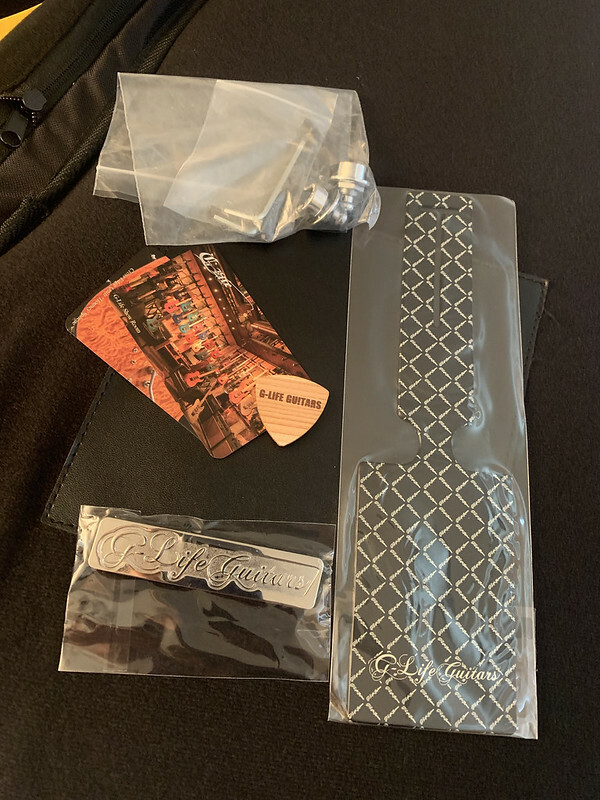 The brand itself is kind of odd since it is more of an extended line of signature guitars. 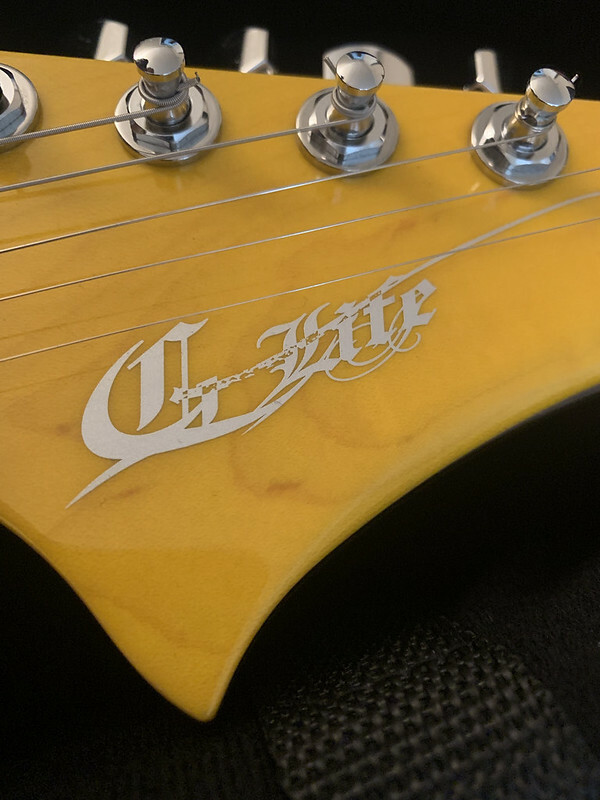 The company was started by Daita Itoh, the former guitarist for Siam Shade. These guitars are all based on what he uses on stage. The trick was trying to buy one. They kept on selling the ones I wanted and then the guitar that was in stock was on tour as part of the G-Life Guitar Fair. It took a couple of weeks to contact Kurosawa Gakki to close the deal. After that, it only took six days to arrive. The guitar is incredibly light (~6lbs.) and very resonant. This was a big selling point because all of other guitars are on the heavy side. It has a fairly complex switching system that offers a huge range of tones. I almost bought the piezo version which has even more knobs and switches. 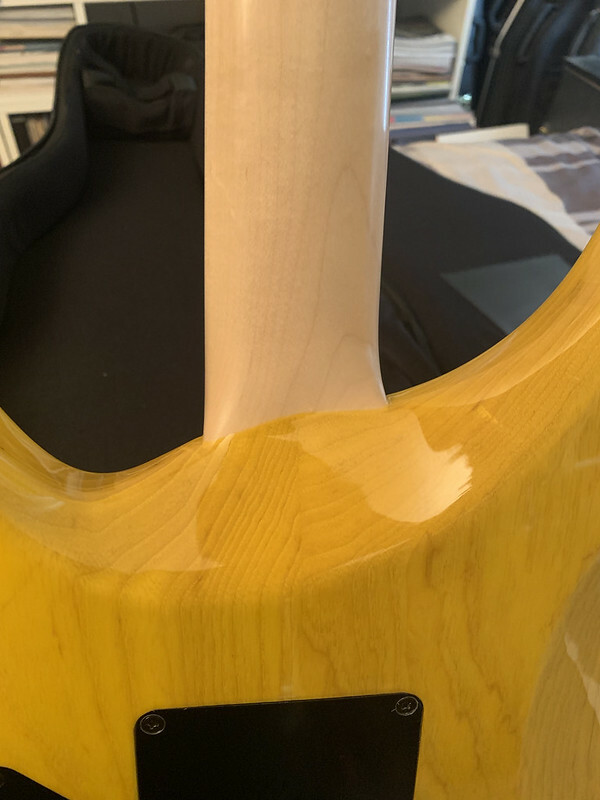 The color is Trance Yellow and one of the new colors for 2019. I didn't want to wait for one of the Moon finishes. 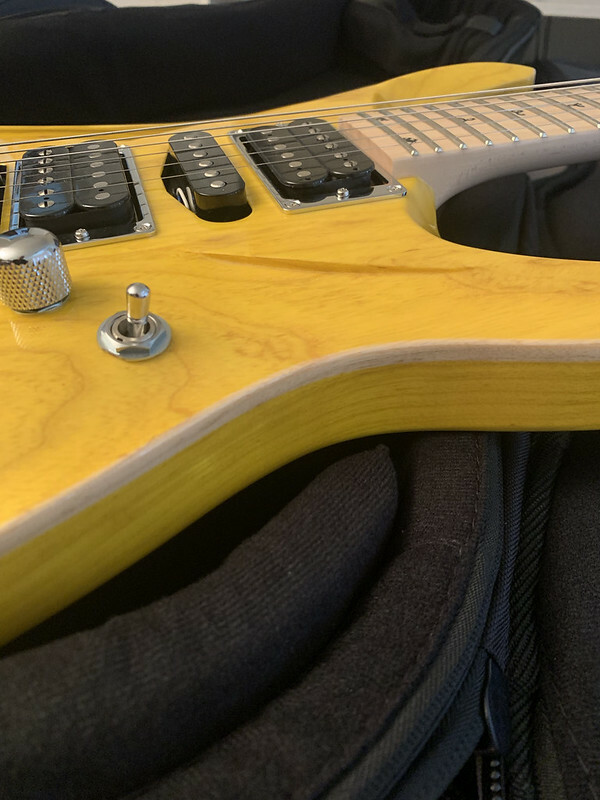 The build quality is as good or better than any of my other high-end guitars (Mayones, Zerberus, Alquier) and the best fretwork of all of my guitars. It's been worth the pain in obtaining. bracky, Leviathus, steinmetzify and 12 others like this. Damn. That's one exotic Son of a Tree! Wow, very cool and unique! HNGD! Is the neck really as paper thin as it looks at the heel? I love that joint style. Congrats on the new toy! One of the best colours in the entire G-Life lineup. Congrats man! I think I spent a week or two trying to decide on the color. It was also based on availability. This was an ordeal trying to buy this guitar. The yellow was in stock then before I could contact Kawasawa, it sold. Fortunately, this one arrived while I was inquiring about availability on other colors. Then they had to find the guitar because it ended up as part of the G-Life tour and ended up in Yokohama. My choice was between this and the Midnight Blue Moon. The neck profile is unique. 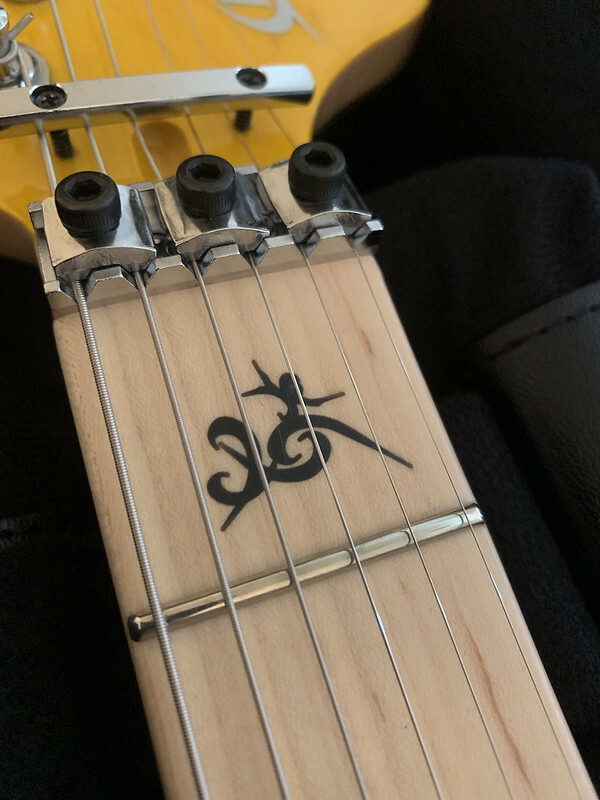 It starts as more or less a strat type C at the nut and then gets very thin near the heel for the upper frets. This makes sense given Daita's playing style. The neck is really comfortable. 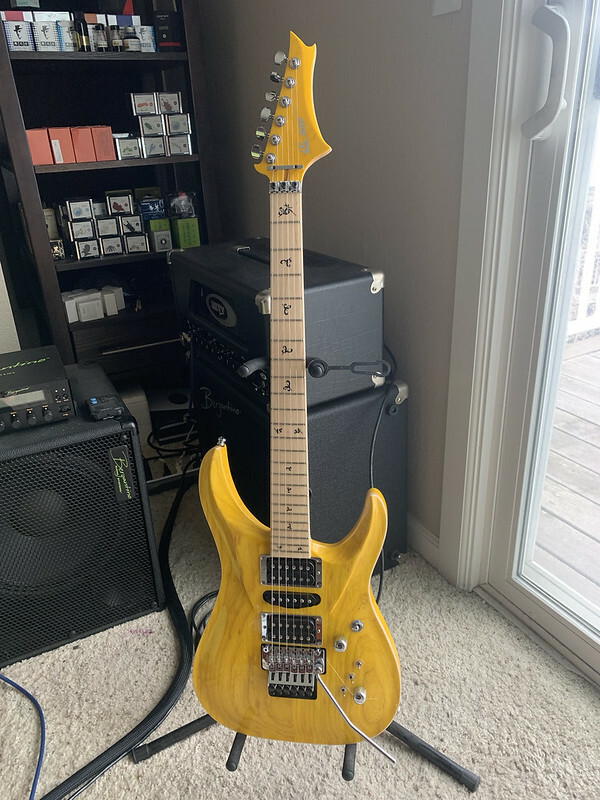 I've never seen a G-Life NGD before, congrats! I've been a fan of the general design language of them for some time. Beautiful! The body reminds me of DBZ guitars. Wowowow I legit have never even heard of this brand(which doesn't say much) Thanks for opening my eyes! and CONGRATS!! 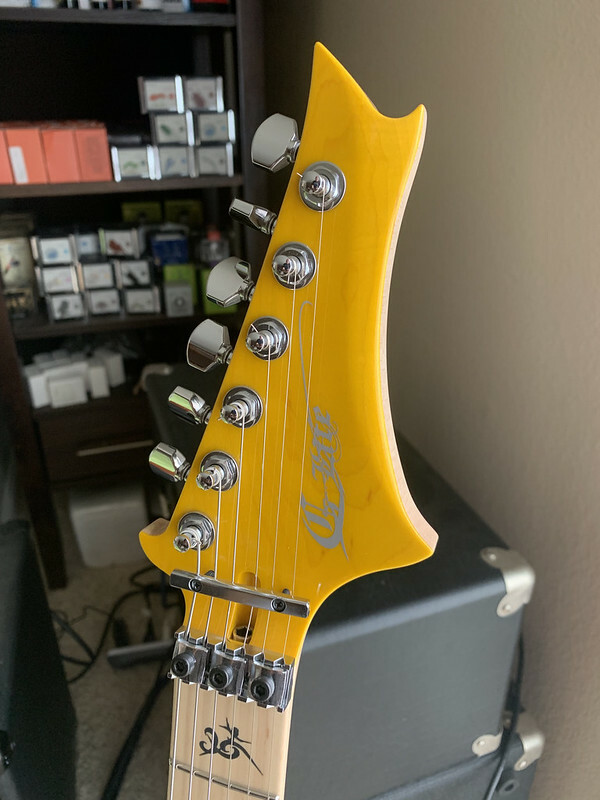 Headstock is a bit out there, but doesn't look out of place on the guitar. Looks super well made. Awesome and exotic score.